This plant is commonly called the Peruvian Lily or Lily of the Incas as it grows in cool mountainous regions of Peru, Brazil and Chile. The genus was named for the Swedish baron Clas Alströmer a pupil of the great botanical classifier Linnaeus who went to South America and sent back seeds of species of this flower. 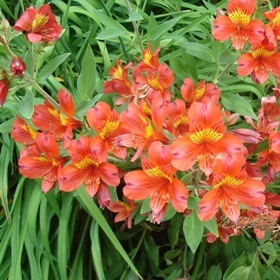 The most fascinating characteristic of Alstroemeria and its relatives is the fact that the leaves are recuperate, that is, they twist from the base so that what appears to be the upper leaf surface is in fact the lower leaf surface!Alstroemeria ‘Moulin Rouge’ with its stunning bright flowers is centre stage and lends red colour and exotic atmosphere to any garden! As a semi-dwarf variety it is also an ideal choice for a large container. Alstroemerias make good cut flowers as they have an exceptionally long vase life.